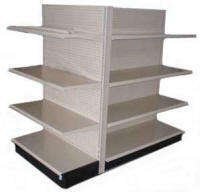 Single Sided Gondolas are well suited for the use of Liquor Shelving as they are extremly strong and sturdy. What makes the gondolas a great choice is the way the base shoe is connected to the upright. This configuration can support heavy loads of most any type of liquid goods such as Wine and Liquor. 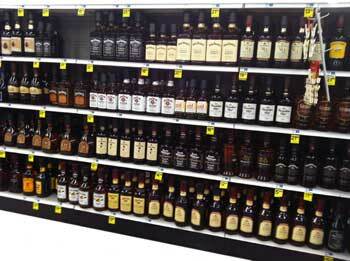 The typical configuration of Liquor Shelving is located behind the main counter of a liquor store. Standard heights are as high as 96 inches and extended heights can be acheived with the use of extension uprights or a 120 inch basic upright by special order. As depicted above, you can see the Double Sided Gondola configured with 2 sections that can provide the display of merchandise on both sided of the shelving unit. Additional sections can be added to increase the length of the aisle as needed. Typically configured for a wall and can be used as an End Cap for the end of a double side aisle of Gondola Shelves. The same components are used for double sided and single sided gondola shelving units. If Liquor Store Shelving is needed for your store, here is a list of the information we need to provide you an accurate quote. Do you need Double Sided or Single Sided Gondolas? How long does your aisle need to be? How high would you like you aisle to be? How deep would you like your base shelf to be? How deep would you like your upper shelves to be?